Luc Besson’s “The Lady” doesn’t have domestic distribution in place yet, but the wheels are already turning as a teaser trailer dropped at Yahoo! Movies today. 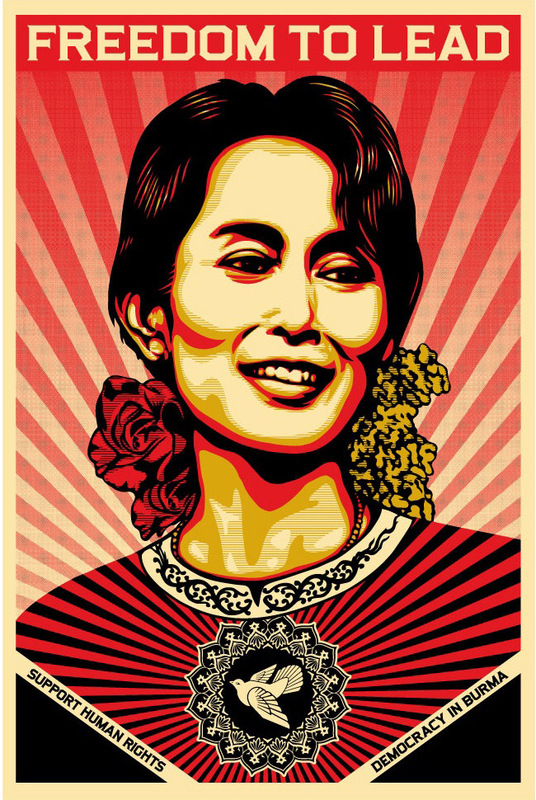 Meanwhile, a Shepard Fairey-designed poster based on the artist’s own piece celebrating Burmese revolutionary Aung San Suu Kyi has also hit. This film could certainly be an awards play for actress Michelle Yeoh and actor David Thewlis. It’ll be part of our festival preview in next week’s Off the Carpet column. For now, check out the full image after the jump. Interesting. Hope this does better than his take on Joan of Arc. I enjoy this time of year when … though lists are abounding with potential top 5s in every category … other options start popping up (like Michelle Yeoh in this instance), and remind us that there will likely only be 2-3 actual noms from the lists we have floating around right now. And thinking of Yeoh (and other brilliant Asian actresses), whatever happened to the Shanghai movie that was made a few years back but never made it anywhere (with Gong Li and John Cusack)? Anyone know what happened there? I believe she should be really considered if her performance is solid enough. Real personalities have a great record with AMPAS. Besides, she has Crouching Tiger behind, for which she was nominated for BAFTA. By the way: Felicity Jones for best actress ? Really ??? For all the talk about wheter she is a suprise or a non-suprise contender I still can’t help but feel the film is a real long shot (as of right now). That said, how fun would it be to have “The Lady” and “Iron Lady” both fight it out. Especially, duue to the inevitable confusion that would follow.